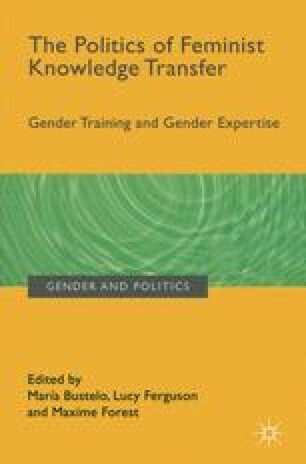 As set out in the introductory chapter, this book is an attempt to offer a critical reflection on the politics of feminist knowledge transfer, bringing together analytical and theoretical work on gender expertise and gender training. Grounded in both the theory of feminist knowledge transfer and experiences of gender training and gender expertise, the chapters elaborate on emerging bodies of literature to advance further what have, to date, been primarily practice-oriented debates. This book articulates an understanding of processes of feminist knowledge transfer as pursuing a transformative agenda, rooted in a structural approach to gender inequality. Feminist knowledge is framed as situated, depending on the standpoints of different knowers. These standpoints do not only result from different disciplinary backgrounds and status. They also reflect different knowledge transfer scenarios — for example, EU member states and countries of the Global South. This book also articulates an explicit acknowledgement of the political nature of the contexts (cultural, institutional, or organizational) in which this knowledge is being transferred and of the potential for contestation. All chapters embrace a reflexive approach, adopting varying degrees of critique towards the biases and limitations this transfer process can reveal. Indeed, the very notion of transfer has been placed under scrutiny, in order to challenge hierarchies of knowledges and place increased emphasis on the dynamic and participatory nature of such a process. For this reason, this book also addresses resistances and contestation as inherent to transferring knowledge from a feminist perspective.